Double angle and half angle identities are very important in simplification of trigonometric functions and assist in performing complex calculations with ease. 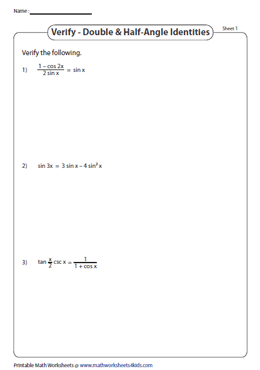 Find the exact value of trig expressions, evaluate trig equations using the double and half angle formula, verify and prove the identities using the worksheets here. Use the double angle identities and half angle identities charts as a precursor to the exercises. 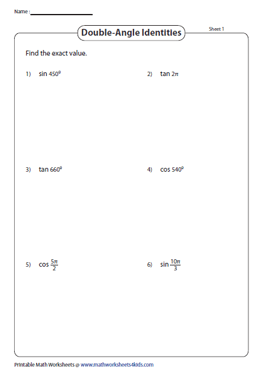 Employ these worksheets with answer keys to find the exact value of the trigonometric expression using the double angle identities sin 2x, cos 2x and tan 2x. Utilize these half angle identities PDFs to find the exact value of a trigonometric expression given as degrees and radians. 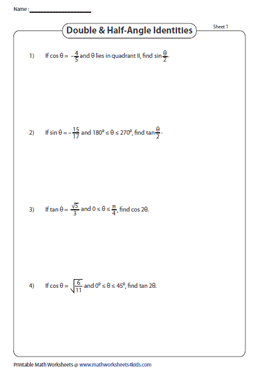 Recapitulate the application of double and half angle formulas with these worksheets. Observe the angle measure, check if it can be expressed in double or half angle and then apply the appropriate formula to simplify. Simplifying complex trigonometric expressions becomes easy with double and half angle identities. Express each trigonometric expression as a known angle measure by doubling or halving to simplify it and express as a single trigonometric function. Apply double angle or half angle identities to determine the value of trig expression based on the trig ratio given and the angle specified in the given interval. 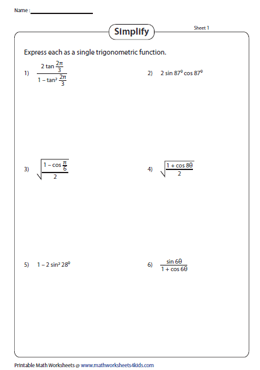 Rattle your brains to verify the double and half angle formulas using logical steps to show that one side of the equation is equivalent to the other with this set of worksheets.